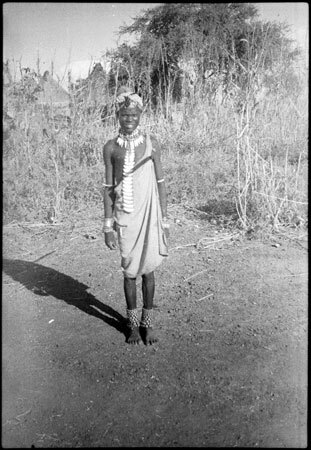 A portrait of a Shilluk youth wearing a headdress, elaborate neck and ankle ornaments, and a stick tucked under the right arm. A homestead is just visible in the background. Morton, Chris. "Shilluk youth wearing ornaments" Southern Sudan Project (in development). 03 Jan. 2006. Pitt Rivers Museum. <http://southernsudan.prm.ox.ac.uk/details/2004.130.36504.1/>.